I have been a fan of Hunter S. Thompson ever since I saw the movie “Where the Buffalo Roam” starring Bill Murray, which was loosely based on the book “Fear and Loathing in Las Vegas.” After seeing that movie I read the book and realized why it was LOOSELY based, because of the craziness that is Gonzo reporting that Thompson did best. 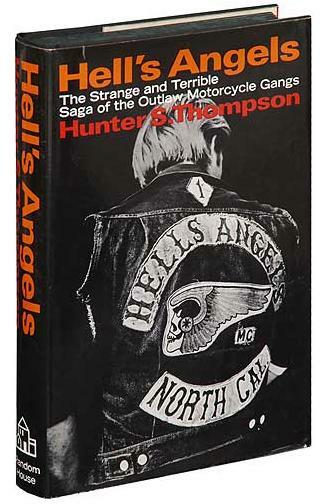 I decided to go back again recently and tackle another Thompson book and this Hell’s Angels documentary seemed a good way to go. In this book you don’t get as much craziness that makes the gonzo, Gonzo. Instead with this book you get the early forms of gonzo reporting where Thompson placed himself at the heart of danger. It is still told in first person as Thompson did best and with some great descriptive narrative that puts the reader pretty much on the back of a Harley and making some runs with the most dangerous group of the 60s. The whole nature of the Hells Angels motorcycle club at the time always teetered on the edge of violence, whether it was running out of beer or locals wanting to chase the club out of town. This documentary not only shows the constant chance of violence, but Thompson also sheds some light on the idea that the Angels just wanted to be left alone. Left to themselves they just wanted to have a good time on weekends and in many cases work their jobs during the week. As with any large group there are individuals that would do something that would get the negative attention and that is what everyone focused on. Thompson presented all the stories during his time with them good and bad. Some of the fun stuff in the book is when Ken Kesey and his Merry Band of Pranksters invite the Angels over for a party and the two cultures converge and the police are the ones that create the clash. Many exciting adventures in this book and at times you feel you are reading a thriller with an exciting ending rather than a documentary. Great writing and interesting cultures make this book a good read. I’m writing lenses on Squidoo and would love you to join me. read by Matt Smith & Clare Corbett. Not sure why it took me so long but not until the 5th season and the 11th doctor did I get into the return of the series “Doctor Who.” I loved it as a kid especially the Tom Baker version of the Doctor. But before I got into the series I had to start from the 9th Doctor and work my way back up to now…I’m now caught up with the TV series and, well, I’m impressed. Great storyline, and the special effects are awesome. The BBC even has 2 spinoff series, on for kids, “The Sarah Jane Adventures” a series for young adults (which ended due to the death of Elizabeth Sladen) and “Torchwood,” which went for 3 seasons, each on a different BBC channel and then coming to America on a subscription cable channel for a 4th season. So now I’m caught up on the series and all the side series’ I’m doing my best to wait for each new episode. So what does an audio book lover do? Find Doctor Who audiobooks, and let me tell you the BBC has done their best to make sure there is a plethora of them available. So far I have liked all 3 of the new doctors (David Tenant was my fave, but the latest, Matt Smith is really growing on me. He’s my son’s fave so hey, there’s that.) This audiobook is a one hour release from BBC Audiobooks and features the 11th Doctor, Matt Smith, and his companion, Amy Pond.) In the continuity of the series this audio falls before the “Big Bang” episode because it features the smiling crack in reality that is always following Amy. In 1929 Lord Woolcroft and his team break open the fabled Tomb of Artemis, sealed for thousands of years, they are astonished by what they find inside…A man and a woman. The man is wearing a bowtie and introduces himself as The Doctor. He then tells them they are in great danger, and thus begins the adventure. As are many things in time this event is a fixed moment and cannot be changed, however maybe the casualties can be lessened so that is what the Doctor and Amy set out to do. The Tomb of Artemis is opened and soon wolves/hounds begin to terrorize the archaeological team. Once entering the tomb, the priestess of Artemis is there and presenting a feast of what seems to be each person’s favorite food. So it seems Artemis is feeding off the mental energy of the humans. Soon Artemis reveals her plan to escape and take over the world, but the Doctor decides this cannot happen. 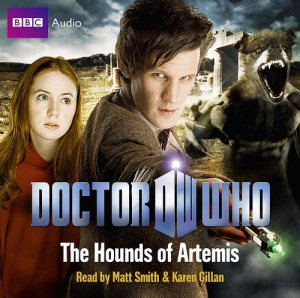 Just as with the tv series this audiobook features excellent writing that makes the adventure one that will keep you wondering what will happen next the book is read by the star of the series, Matt Smith and by Clare Corbett. Clare Corbett’s reading sections are when the story is being told from Amy Pond’s diary and as the teller of the story, a descendent of one of the archaeological team. 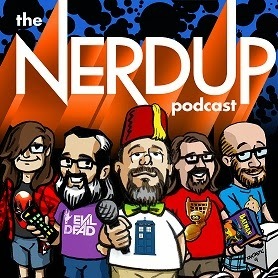 Matt Smith delivers the rest and gives the story that extra Doctor Whoishness. Great little audiobook that may get you hooked into the Doctor Who world if you aren’t already. Before we get into the story, I’ve got to explain why I’m listening to this book. I got introduced to the stories of L. Ron Hubbard that appeared in the many pulp fiction magazines of the early – mid 20th century via Galaxy Audiom and it all started with Hubbard’s sci-fi/fantasy stories. 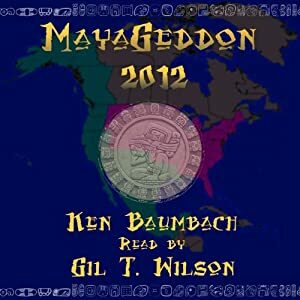 I’m a huge sci-fi fan, and listening to these classic stories produced by Galaxy Audio would blast me off into several universes and realities. I then got curious and started listening to the other genres, from air adventures, mystery, sea adventures and westerns. I’ve never been a fan of westerns but after hearing the great production in the others I gave them a chance with this collection. I was amazed, they were fun and with the great sound effects, music and superb voice acting Galaxy Audio got me interested and since then I look forward to the next one. This story is yet another superb production, in which you’ll be ducking bullets and hiding behind rocks to get your next shot in. 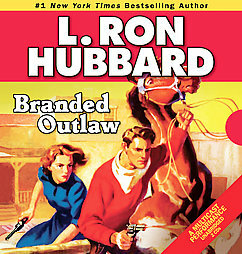 “Branded Outlaw” was originally published in the October, 1938 issue of “Five Novels” monthly and tells the tale of “Suicide” Lee Weston, who returns to Pecos, New Mexico from Wyoming, to help his father who has written Lee telling him of an enemy by the name of Harvey Dodge. Weston is thinking Dodge is trying to take over his father’s land and stealing his cattle. When he arrives he finds his father murdered and the homestead burned to the ground. Weston then heads into town seeking revenge on Harvey Dodge. The Sheriff tries to calm Weston, but as Weston leaves the Sheriff’s office a gunman challenges him upon hearing he is seeking out Dodge. Weston narrowly escapes but manages to kill the gunman. The problem is one of the stray bullets from the gunfight has killed a passerby. Weston is now wanted for murder, he heads for the hills and a private fishing lodge he stayed in as a kid. At the lodge Weston is found by a woman who nurses him to health, and in classic Hubbard style the twists begin in that the woman is the daughter of Harvey Dodge. Weston sets out to stop the man responsible for the series of cattle rustlings and land grabbing after finding out that Dodge may not be behind it. But trouble ensues as well as the gunfights. Can Weston prove his innocence before meeting up with the lynch mob out for him? In a tale that is a CLASSIC western, you’ll need to tighten up your spurs because you are in for the long ride until justice prevails in the old west. 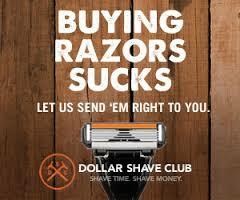 Just plain classic western writing with a very visual description. Once again I’m going back to my theatre roots and listening to an audio performance of a classic play, “Death of a Salesman.” While in college I acted out a scene from this play and from that moment I fell in love with it. Not sure why, I mean, it’s not really a happy play, but something about this play grabbed me. I think mainly because it was the first play I’d read and performed and that it seemed to tell it straight. Life does not always turn out like you want. When I ran across this audio performance from L.A. Theatre Works (LATW), I knew I had to give it a listen mainly because of Stacy Keach. He’s a subtle actor yet can give you a larger than life performance. In this performance he knocked it out of the ball park. I had seen a version of the play on television with Dustin Hoffman as Willie Loman and thought at that time I had just seen the only person who I could ever picture as Arthur Miller’s salesman. But now I have to shift that to Keach. Mr. Keach performed the role to perfection. As you can see, I was highly impressed. Everyone in this performance was great, Jane Kaczmarek (you know, the mom in TV’s “Malcolm in the Middle”) did a wonderful job as Willie’s wife, Linda, but let’s face it the play is about Willie Loman, and the star shined brightly. Actually while were talking about being impressed, this makes the 4th or 5th performance from LATW that I’ve heard and each time they impress me, not only with excellent casting, but the productions are superb. Each release places the listener directly into the audience of the performance, with excellent sound effects, music and just a dash of the audience response to remind you you are listening to a performance. 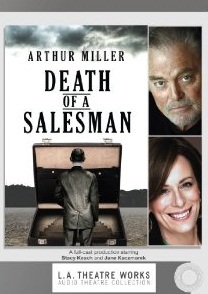 “Death of a Salesman” is the story of an aged salesmen who was always wanting the best for his family. He wanted his boys to grow up and be well liked, not just liked, but WELL liked. The problem is that the reality of Willie Loman’s life never really matched up to his dreams. He is full of regrets, such as missed opportunities, never knowing his father and his son, Biff who was a High School football star that could have gone on to play in college. The problem is that Biff flunked out of Math and refused to go to summer school and never went to college. The play takes place in Willie & Linda’s home when Biff is back from “out west.” Hap, the other son, who is trying to follow in his father’s footsteps still lives near to home, is also visiting. Willie cuts short his trip from Boston because he nearly runs off the road while driving. Wille has lately become a victim to his mind wandering and he starts revisiting his memories out loud. The play is told with a constant barrage of flashbacks from Willie’s point of view as he begins to see the reality of his dream. Linda tells her sons of Willie’s troubles and that she believes he is trying to kill himself. It all builds up to a scene, where to make their father happy, Biff and Hap attempt to go into business together, but reality comes crashing down on everyone leaving a tragic ending. This performance from L.A. Theatre Works is superb in every manner and this classic play is one that should not be missed.